For centuries, the Nez Perce Tribe of American Indians lived in the warmer river valleys, but passed through present-day Nezperce, hunting and gathering, on their way to their seasonal encampments. In 1805 about 18 air miles northeast at present-day Weippe, the Nez Perce met and nurtured the starving Lewis and Clark Corps of Discovery as they emerged from making the extraordinarily difficult crossing of the rugged Bitterroot Mountains. The Nez Perce accompanied the revived Lewis and Clark party to present-day Orofino and assisted them in making dugout canoes that would carry the expedition to the Columbia River and the Pacific Ocean. The Nez Perce provided Lewis and Clark further assistance on their return trip to St. Louis and Washington D.C. the following year. On November 18, 1895, former Nez Perce Reservation land became open for settlement by non-Indians. At that time, an estimated 5,000 people were poised to participate in the land rush, but it was more properly a “sneak”. “As usual in such cases there was a great rush for choice locations, but the ruffianism so generally characteristic of these races for homes was conspicuous for its absence”. George W. Tamblin selected and platted the Nezperce City townsite, which he named after the Nez Perce Indians. The site was informally called Nezperce City for an unknown length of time and eventually the “City” was dropped. Frank Graham was quoted in an interview in the Nezperce Herald in 1951; “The year prior to the opening I worked for a surveyor, George Tamblin, laying out the townsite of Nezperce… mark it off into lots, conceal the markings, which were called bench marks, underneath the tall bunch grass, which then covered the land. A sentinel kept watch and at the approach of meddlers a signal was given and work ceased. Finally the job was finished and 160 acres of land looked just like the rest of the prairie”. For his work he collected a dollar a lot. There were 690 lots altogether, 526 of which were taken at opening. A block was set aside for a public school and 25 lots reserved as bonuses for the erection of business houses to cost not less than $500 each. Miss Margaret Simons was given two lots for being the first lady in the new town. Continuing his story the narrator said that by July 1896 (eight months later), the main street (present day Maple)…” was all built up solid over half the length of the town. The present main street ( Oak Street) had several buildings, but was kept mostly for a race track to settle who had the best horse”. The town continued to build and reached its zenith about 1911 with approximately 1,800 to 2,000 people living in town. The six years preceding incorporation were the toughest because of ill-prepared homesteaders. It was reported by the Nezperce Herald in an article datelined March 15, 1901…”Few, if any, except those who endured them, know of the hardships that presented themselves to the pioneers of this fertile prairie. But, with each passing season life on the farm became, maybe not easy, but easier. The rapid buildup of Nezperce City created a hub where supplies could be purchased or bartered for. The delivery of mail in and out of Nezperce began early in the first few months of settlement. A post office was built in Nezperce with a new postmaster presiding and many routes were established to carry the mail to all the homesteads and neighboring towns. There have been approximately 18 postmasters/mistresses since 1896. In July 1901 Nezperce was incorporated and organized under regulations for a village. There was no town government as such until that year. There were five trustees in the beginning, but in 1902 a citizen’s ticket was made up and there were no contests for E. L. Parker, T. M. Mockler, Dr. J. H. Lewis, Z. A. Johnson and W. C. Foresman. Before the July 4 th celebration in 1904 the council asked the citizens to not only decorate in red, white and blue but to also use the official colors of green and red. An unofficial census that year counted 883 residents in town. The Lewiston Tribune reported on December 4, 1895 that within three weeks of incorporation there were six business houses in course of erection and foundations for many others to be erected as soon as lumber could be had. A large store, town hall, barber shop, restaurant and hotel were among the first to go up. By March 1901 the town boasts of a larger and healthier growth since the opening of the reservation than any other town on the prairie, reported the Nezperce Herald. It is a natural trading point for a radius of 15 miles. We have seven general stores, two hardware and implement houses, three blacksmith shops, a small machine shop and woven fence factory, two harness shops, two drug stores, two first class hotels, one restaurant, four churches and a flour mill. A two story wooden hotel was erected on the corner of 4 th and Oak about 1900 called the Nezperce Hotel, and the lot has never been used for any other but hotel purposes. Also reported were several “red light district” houses. The price of wheat in 1901 was 45¢ per bushel. Most early church and school buildings served a dual purpose. The early school houses were treated as community centers. Since they were often built with donated land and labor the community felt free to use them for everything; schools, socials, dances, programs, funerals and churches. By 1903 there were six churches in Nezperce. The Presbyterians were among the first, followed by the Methodist, Christian, German Baptist, Catholic and Baptist. The new Catholic Church was built on the hill in west Nezperce in 1904, with St. Anthony’s Parochial School opening for classes in the fall of 1907. The history of the public school is almost two hours older than the history of the town. On the opening day a committee was appointed and set out about 10 a.m. to choose lots. They settled upon the present site, at the top of the hill with a view of the whole town. The summer of 1896 saw the first school built, a very small 12’x24’ building costing $17.00. By 1897 it was deemed inadequate, so a two-story building went up in 1898. Cost: $175.00. In 1902 a third and more imposing two-story structure became necessary. The cost was bonded for $5,500. The enrollment in 1904 reached 302 students, with a four year high school beginning in the fall of 1906. An election was held in 1911, in which a $45,000 bond issue for a new school was carried by a large majority. Work began on the fourth public school in the spring of 1912 and opened in January 1913, (including flush toilets in the basement). The fifth and current school was moved into during the 1962-1963 school year. One of the first projects the new town council brought up in 1901 was drilling a public well. Several wells were drilled at various locations and depths in the next few years and in the spring of 1904 plans were made for a piped water system for the town. The insurgence of annual typhoid fever outbreaks was a major reason to improve the water supply. The new system was completed to most of the residents and businesses by September 1905. Some of the old mains were dug up for repairs during the 30’s and were proved to be made of wedge shape strips of wood bound together with heavy wire. The water caused the wood to swell and kept it leak proof. One of the early water works owners, Leroy Miller used as a slogan “The water is free, we only charge for delivery”. The actual date of the first electric power plant constructed is unknown, but was built about 1903 by Z. A. Johnson for $35,000. It was noted in a newspaper report in 1904 that someone shot at an insulator and put the electricity out of service for awhile. The source of the electricity was a dam on Lolo Creek, a tributary of the Clearwater River just above the town of Greer with the main power line coming up over the breaks entering Nezperce from the north. Street lights were installed in the City during that same period. By 1903, just eight short years since settlement of the townsite Nezperce had grown considerably with many businesses such as; 7 general merchandise stores, 2 hotels, 2 restaurants, 2 livery stables, 4 grain dealers, 3 drug stores, 2 blacksmith shops, 4 soft drink & confectionery shops, 1 gents furnishings store, 2 furniture stores, 2 hardware stores, 2 millinery shops, 3 banks, 1 newspaper, 2 roller mills, 1 jewelry store, 2 harness shops, 2 meat markets, 2 brick manufacturing plants, 2 draying companies, 1 barber, 1 notary public, 3 contractors, 3 real estate offices, 2 law firms, 4 physicians, 1 dentist and 1 photography shop. The building of the railroad to Nezperce opened the new city to accelerated growth. First discussions of a railroad was in 1900 when there was talk of an electric line from Lewiston to Grangeville, through Cottonwood, Denver and Nezperce, although how they expected to achieve that particular routing is a mystery. In September of 1908 the Nez Perce and Idaho Railroad (later to become the Nezperce & Idaho Railroad, then the Nezperce Railroad) was incorporated and was finally completed in 1910. The Herald reported on June 6 “…just before six o’clock Monday evening the last rail of the main track was laid and spiked in place, and when the day’s work was over what had been open commons at the south end of Oak street had been converted into a very respectable looking railroad yards. The switches were in place with a siding extending past Nezperce Roller Mills and granaries, also past the newly erected stock yards and the big grain warehouse of the Farmers Union. Construction of the station will start soon.” This new railroad was connected to the Northern Pacific Railway at Ilo (now a part of Craigmont). Fares charged on the new railroad were $1.00 roundtrip to Vollmer (also a part of Craigmont) and $2.40 to Lewiston and return. Nezperce was connected to Mohler and Peck when the first telephone line came into town March 15, 1901. Beyond Peck the telegraph had to be used to reach the outside world. The first telephone company was called the “Barbed Wire Company” and may have been an informal organization. By 1904 it was formally incorporated as the Nezperce Co-Operative Telephone Company. Later in 1901 the “Barbed Wire” phone line was strung to Kamiah. This may have been literally true. It was not at all unheard of to have the top of a farmer’s fence double as the phone line with the use of a little insulation against the posts. This very successful system ran until 1923, when a sale was arranged to the Pacific Telephone company (forerunner of Pacific Northwest Bell). The first newspaper, the Nezperce News was established in 1896, just a few short months after the opening of the reservation and probably disappeared soon after opening. The second newspaper was the Record, which later became the Nezperce Herald, with the subscription rate being $1.00. The newspaper was then sold to W. P. Conger in 1909. Most newspapers were very political in the early years, with Nezperce being very “Democratic”. Conger did his best to keep political fires fanned, writing such tidbits during World War I such as; “One serious defect is noticeable in the selective draft law. It should have included food speculators and the idle rich.” and “Congress shouldn’t worry. The mentally deficient are exempted from the draft.” The newspaper was in the hands of W. P. Conger and his son, Ernest for over thirty years. The social events and gatherings were always in season during the early days of Nezperce. 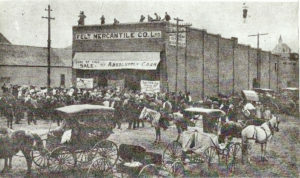 There were many fraternal and social clubs, such as; Modern Woodmen of America, the auxiliary, Women of Woodcraft, Royal Neighbors, The Oddfellows, Order of Masons, Eastern Star, Knights of Pythias, Pythian Sister, Knights of Maccabees and the Loyal Neighbors Club (now known as the North Nezperce Club). Around 1905 the prairie wished to separate from Nez Perces County. There were many and various schemes, names and boundaries proposed. First it was to be called Koos Kooskia and take a portion of Idaho County. Then the name Lolo was proposed and in 1906 the name Shoup (for a former governor) was mentioned. Later a newspaper article stated positively that the new county was to be called Kamiah. Finally the name was settled and would be called Lewis County to honor Captain Meriwether Lewis. In 1907 a county division bill was launched and defeated in the legislature. It was tried again in 1909 and finally on February 28, 1911 the bill creating the county was passed and became effective on March 20. Of course every town in the county wanted to be the county seat. Reubens wanted it two years before there was a Lewis County. If Ilo and Vollmer had been a united town, instead of squabbling with each other over nothing, the county seat might have been in Craigmont. Kamiah was on the far eastern edge and not easily reached from the prairie and it was not then the most populous town. So Nezperce, with its larger population and pride in being the first settled town on the reservation voted itself in as the county seat. The 1877 passage of the Dawes Act opened all Indian reservation lands for settlement. The Act became the legal basis leading to the founding of Nezperce as well as many other non-Indian settlements. The railroad was a major turning point. It established the city as a commercial center and the most prominent community in the area. On March 20, 1911, the Legislature created Lewis County. In 1910 the U.S. Census reported the city’s population at 599, reaching a peak of about 2000 in 1911, then decreased to about 1000 by 1918. The city’s growing population, location and availability of railroad transportation were factors influencing voters to select Nezperce as the county seat. This selection provided a source of stable employment for public and private workers and gave prestige to the new county seat of government. History of North Idaho – published 1903, embracing Nez Perces, Idaho, Latah, Kootenai and Shoshone Counties. Remember When – published 1976 by Margaret Nell Longteig and Rheba Miller.